KANSAS CITY, Mo. 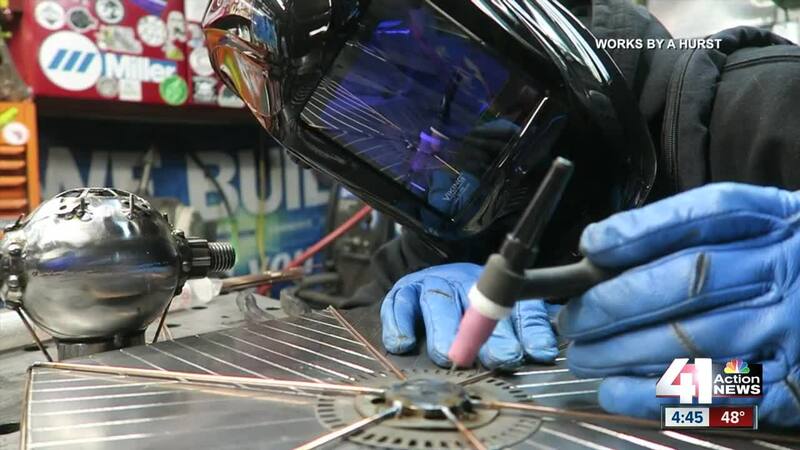 — A Kansas City-area man who turned an accident into an opportunity is now making money off his passion and hoping to turn it into a full-time job. Five years ago, a drunk driver took out Jason Hurst's mailbox. The incident led him to begin making art in his shop beneath his garage. “I said I want to replace (the mailbox) with something robust and something unique," Hurst said. As an artist and science fiction fan, Hurst built a Star Wars mailbox that caught the attention of more than just his neighbors. "It's been a five-year journey of now making art just for the sake of making art," Hurst said. Hurst, who is self-taught, said he had no background in welding or art, other than building LEGOs as a child. "My wife bought me two books for Father's Day 10 years ago, and I'm one of those self-motivated people that I just learned through watching YouTube videos and practice, practice, practice," Hurst said. It often takes hundreds of hours of work to make just one sculpture, and it's all a side gig for Hurst, who works full-time with the railroad. According to the U.S. Bureau of Labor Statistics, almost 5 percent of workers held more than one job at the same time in 2017. More women hold multiple jobs, but side jobs for men are on the rise. Hurst hopes to grow so he can make his art his full-time business. In his spare time, Hurst said he will continue to create work, but also focus on inspiring others. "Instead of trying to sell them a sculpture, I'm trying to teach people how to sculpt and how to do what I do because it's a really good way to spend your time," Hurst said. At the end of April, Hurst will launch a Kickstarter campaign after writing and self-publishing a comic book titled “The Oldest Road” with his best friend.